I love broccoli salad. 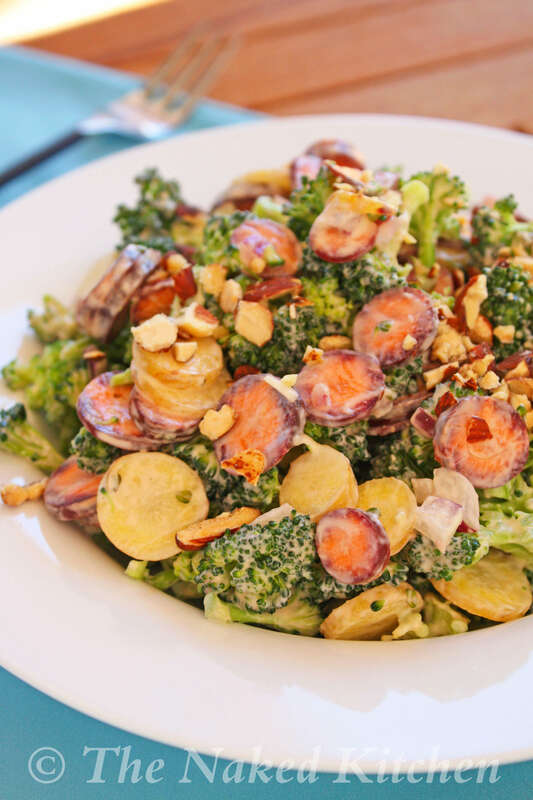 Our original Broccoli Salad recipe is one of our most popular recipes but since mayo and bacon are no longer on our menu, it was high time I find an alternative. Every week I see these beautiful purple, yellow and orange carrots and I always think, “I should make something with these”. Well, I finally put them to good use in this crunchy, healthy broccoli salad makeover. Place the first 7 ingredients in a blender and process until thick and creamy. Set the dressing aside. Add the remaining ingredients to a large bowl along with the dressing and mix well. Sprinkle with crushed almonds, if desired, and serve. The dressing for this salad is an excellent mayo substitute. You can use it whenever mayo is called for. Leftover salad can be stored in an airtight container in the fridge for up to 2 days.